Brian and Aimee Mariani were both raised with a solid foundation and a deep passion for God’s word, science, and God’s Creation. In public schools and secular universities, Brian saw the deception of evolution all around him. He later taught the credibility of creation and the pervasiveness of evolution from a Biblical perspective as a science teacher at a Christian high school. Aimee has spent many years teaching campers about God’s creation at a Christian living history camp. They met at a Bible College that strengthened their creation worldview where Brian also had the opportunity to be one of the main researchers and contributors to the book, The Genius of Ancient Man. 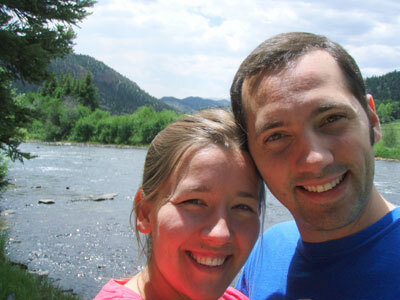 Brian and Aimee joined AOI in 2013 because they have a passion to teach others about God through history, science, and His creation. They have been hard at work developing AOI’s Discover Creation Training Institute. Make sure you check out the Marianis’ Blog (Adventures in Faith) and Youtube channel to keep up to date with their adventures and teaching. They will also be blogging regularly on the Discover Creation Blog. The length of each presentation is 40 to 60 minutes long. Some changes can be made to fit each situation. PowerPoint is used in almost every presentation. *Note that the presentations below have all been designed to be suitable for teens and adults, but have also been edited to be more understandable for KIDS. Brian Mariani will let his energy and enthusiasm flow in an engaging and interactive format. In addition, Brian and his wife Aimee have collected and developed many interesting crafts, activities, and science experiments that all have relevant Biblical application. Brian also has interactive, hands-on fossil activities that will give people an up-close view of evidence for the worldwide flood and the truth of the Bible. **Brian’s 8 Favorites are denoted with the 2 asterisks! This presentation introduces the major issues and assumptions that cause the Creation/Evolution debate. In this presentation, you will hear Brian Mariani’s testimony of God’s active work in calling him and his wife to Creation ministry. Audiences will learn the importance of waiting on the Lord and trusting Him in every situation, good or bad, even with limited understanding. In this presentation, Brian Mariani tackles some fundamental apologetic questions including “Is there a God?” and “Why should I believe that the Bible is God’s Word?” Audiences will see evidences for the truth of God and the Bible as we discuss how to prove what we believe and why. Many people, even Christians, believe that Genesis 1-11 is more of a fable with good morals and meaning than it is a true historical account. This is primarily due to the fact that millions and billions of years have been presented as scientific fact, and thus many people have compromised the Bible with secular interpretations of science. Brian Mariaini, as he teaches through this passage of Scripture, will show that a literal, plain reading of Gen 1-11 is a more logical conclusion. The first eleven chapters of Genesis provide the foundation for God’s Word and lay out many of the Bible’s main doctrines. Gen 1-11 covers the Creation of the world, the corruption and consequences of sin, the worldwide flood, and the history and dispersion of mankind around the Earth – the knowledge of which is vital for properly understanding the rest of Scripture. If one doesn’t believe that Genesis 1-11 is true, then what else can they disbelieve or reinterpret in the Bible? This presentation deals with different interpretations, different assumptions, and different biases as different people often come to totally different conclusions. See evidences from science and the Bible that match perfectly. Discover the words God emphasizes in Genesis that make the interpretation very clear. Astronomy is the study of the galaxies, stars, planets, moons and ultimately the whole universe. In this presentation, you will learn how the wrong assumptions lead to wrong conclusions that don’t fit the observations. We will consider questions like: Was there really a Big Bang? How do stars, planets, and moons form? What is Dark Matter and Dark Energy? Learn some of the biggest challenges to the naturalistic/evolutionary perspectives that could demolish the supposed billions of years of history. If the Earth is only 6,000 years old, then how does light reach us from galaxies so far away that it would take billions of years to get to us? There are numerous possible explanations to this nagging question. Explore the brief overview in 20 minutes or a more in-depth look at the arguments. Ultimately, evolutionary naturalism has some problems of its own! Just be amazed! Let’s have fun exploring our Universe too big to wrap our minds around. And let’s stand in awe as we remember that our God is a BIG God! What do we know about the planets and moons from our solar system? How did they form? How have they come to be the way they are today? Could they have formed naturally in the aftermath of a Big Bang and subsequent supernovae, etc? What can we learn from our scientific observations and explorations of planets and moons beyond our own? Geology is the study of rocks, and geologists have to make a lot of assumptions regarding how those rocks have formed and moved over history. In this presentation, Brian Mariani will demonstrate how a Young Earth perspective simply makes more sense than a long-age uniformitarian view. You will see modern examples that show how it doesn’t have to take a long time to form fossils or rock. In the Pacific Northwest, there are incredible geologic features often overlooked. Huge layers and columns of basalt rock cover hundreds of square miles – evidence of massive volcanism in the past. Large river channels (like the Columbia River Gorge among others) and valleys have been since carved through that hard basalt rock. Huge boulders are left scattered in fields as well as pesky water-worn boulders in farmer’s fields. Be the scientist to best interpret what has happened in the region. “It’s just a rock.” Or is it? For those untrained in geology, what are we missing in the rocks all around us? In this fun introduction to the Floods of the West Geology, students will be able to gain “A Whole New World” of perspective on the “Grand” scale and scope of Geology. Dave and Mary Jo Nutting and Brian Mariani have led numerous field trips to the Southwest including many of the National Parks. Follow Brian as he leads you through this tour – showing evidence after evidence of the presence and power of water necessary for the quick deposition of rock layers, rapid and recent erosion, fossil evidence and much more! Evolution is taught as “fact” in textbooks, schools, museums, national parks, and the media, but has modern science really confirmed Darwin’s theory? Brian Mariani shows why the common “proofs” of evolution do not hold up to scientific scrutiny, but instead affirm the Biblical account of creation and the fall. This understandable, beautifully illustrated program helps you and your family ask the right questions so that you will not be taken in by “accepted” scientific dogma and typical textbook arguments. Do you remember Bio 101? This is the return of that class though hopefully in a more exciting and interesting way. Join Brian Mariani on this journey to determine if life can arise naturally on its own with just pure chemistry. Mutations and Natural Selection are held up as the two mechanisms for Evolution – are they enough? Be amazed at the incredible and increasing complexity of DNA – can this complexity be explained by Evolution? It is now over 150 years since the publication of Charles Darwin’s culture-changing book, On the Origin of Species, but the question remains, “Was Darwin Wrong?” Brian Mariani gives compelling reasons from the fossil record to show that evolution doesn’t hold up. He exposes the battle for your mind and demonstrates how people get fooled into believing evolution by the pictures they see. Using examples from the fossil evidence and artistic reconstructions, Brian encourages children, youth, and adults to ask the right questions, to evaluate so-called “scientific” evidence, and to stand firmly on God’s Word. Evolved or Made in God’s Image? The Theory of Evolution teaches that humans have evolved from ape-like ancestors. If that is true, then there should be solid evidence of those pre-human transitions. Many have been claimed, but significant challenges to those claims have been raised that would cause us to ask the question “Did humans really evolve?” In this presentation, Brian Mariani will compare the claims and the consequences of evolutionary teaching with the Biblical perspective. Ultimately, we find that the Bible offers for man what is entirely contrary to the evolutionary view: great hope and purpose to life! How did life originally form and what is the probability that we could have evolved to the complex state that we see today? In fact, some systems and processes appear to be irreducibly complex – meaning that every part had to be present or else that system or process could not function. Brian Mariani will explain these evidences, along with the apparent design of the Fibonacci Sequence in Nature, and propose that these are challenges that the Theory of Evolution cannot sufficiently answer. **What Happened to the Dinosaurs? In this presentation, Brian Mariani will share what the Bible says about dinosaurs and look into sources of both ancient and surprisingly recent history to understand cultural traditions regarding dragons. Recent evidence will also be presented to show that dinosaurs must have lived more recently than supposed millions of years ago as is commonly taught. Creation/Evolution: Why Does it Matter? Why is there pain and suffering in the world? How can we properly interpret history and what can we learn from history? Does the Creation/Evolution controversy really matter? Does it really matter what we believe and why? History has shown us that ideas have consequences and the future will most certainly continue to demonstrate that. We are in a battle of worldviews today and it will affect the faith and lives of people worldwide. 5 Common Deceptions: Why Creation Is So Important! The Bible begins with Genesis and explains how God has created the world in 6 literal days. Brian Mariani explains that this passage truly is foundational to the rest of the Bible and all that we believe. Everyone has faith in something. Biblical Creation is consistent and there is evidence to back up the claims of the Bible. Many believe and will even claim that evolution is basically a proven fact. Brian Mariani will explore each of the major scientific disciplines – Geology, Biology, Astronomy, and Anthropology. He will show you how there are major problems for the evolutionary/naturalistic perspective in not just one of those disciplines but in all of them and almost each issue is substantial enough to ruin the theory of evolution. In doing this, Brian will show how a Biblical Creation viewpoint has more logical and solid answers to these topics. Topics include: Rock Layers, Fossils, Missing Links, Irreducible Complexity, Simplest Organism Known, Comets, Star and Planetary Formation, Dark Matter and Dark Energy, Legends of a Global Flood, and Legends of Babel. Many believe and will even claim that evolution is basically a proven fact. Brian Mariani will explore each of the major scientific disciplines – Geology, Biology, Astronomy, and Anthropology. He will show you how there are major problems for the evolutionary/naturalistic perspective in not just one of those disciplines but in all of them and almost each issue is substantial enough to ruin the theory of evolution. In doing this, Brian will show how a Biblical Creation viewpoint has more logical and solid answers to these topics. Topics include: Salt Layers, Petrification, Mutations, The Probability of Abiogenesis, The Creation of the Moon, Our Receding Moon, Earth’s Perfect Placement, Fine-Tuned Constants of the Universe, The Fibonacci Sequence in Nature, The Trustworthiness, Portrayal, and Interpretation of History, and Evolution and Hitler. What is Science? What is Evidence? With the Creation/Evolution controversy, it is crucial to first answer these questions. Join Brian as you look at the history of science, scientists, and even the current perspectives on the matter. What is the proper take on Faith vs. Reason, Science vs. Religion, etc? Contrary to popular belief, ancient man was not a dumb cave man that dragged his woman around by the hair. As recorded in the Bible, “ancient” is really only a few thousand years ago and man was created by God to live with God in the garden. Adam was intelligent right from the start. Brian Mariani explains this and shows how the current evidence of ancient ruins spread all over the world show intelligence, connections to one similar ancient civilization (Babel), and all of this evidence confirms the history and timescale of the Bible. Brian Mariani will share some of his strategies for reaching out to college students (among others) using surveys, questions, and conversations. Our culture is filled with a lot of confusion and misinformation. It is so often hard to know what is true – or maybe more importantly how to think. Brian will share some of his exciting experiences interacting with people of different beliefs. Search the scriptures with Brian Mariani to see how God has worked and is still working and active in our lives today. Hear testimony of God’s provision through Brian’s life and for others as well. See God’s heart from the scriptures and learn to trust God more in any situation…no matter what! Brian will challenge you with questions like: Do you really believe the Bible? Do you really believe God? How Big is your God? Be strengthened from Psalm 37 as well as other scriptures that encourage us to give up control, wait on the LORD, and He will provide. Dr. Brain is Brian Mariani’s goofy “twin brother”. He is an atheist/evolutionist and asks some hard questions. Ask and see if Dr. Brain is available to challenge people young or old on what they believe and why. This presentation is not intended to stand alone, but should be coupled together with one or more other talks from above. Can you answer the questions and challenges of a skeptic?